Hollola is a place of history, tradition, nature and activities! municipal infrastructure; streets, parks, playgrounds etc. Duties of Building Supervision include advice and counselling regarding licensing issues and licensing procedures. Building Supervision is also responsible for building inspections, including special plans, site inspections, supervising the condition and cleanliness of facades and the environment, and supervision based on complaints and notifications. Tasks of the Municipal Environmental Protection Authority include environmental permits, notifications and registrations and their supervision, supervising the condition of environment, environmental consulting and waste management monitoring in Hollola. 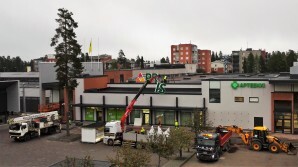 The bodies responsible for the organization of waste management are Päijät-Häme Waste Board and PHJ (Päijät-Häme Waste Management Ltd). Local and regional bus transport is carried out by Lahden seudun liikenne LSL (Lahti Region Transport). The blue LSL buses drive for example from Lahti City center to Salpakangas in Hollola. For routes and schedules visit http://www.lsl.fi/english/.